Many of you reading this likely know that our focus at Chicory Wealth extends beyond just nuts-and-bolts money management. While this is important, we see our role in a wider lens too: helping create balanced lives, socially just communities, and a healthy planet. We know many of you do too. We all exist inside society’s complex, all-encompassing money system, but we rarely talk about it in an honest, self-reflective way. Is it possible to live within this system with integrity and meaning – to find a deeper connection to the “heart”? The answer is YES, and Integrating Money and Meaning is the guide. 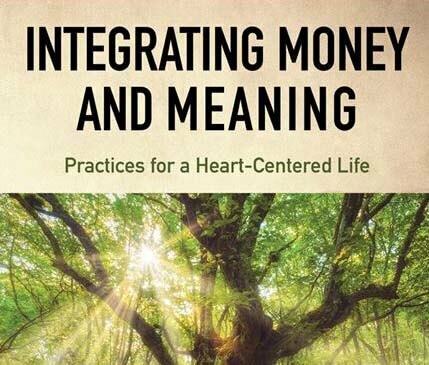 Using her own story and the stories of others she has met during her many years doing “pastoral care with money” for both individuals and spiritual communities, Maggie Kulyk offers a deeply personal and honest look at the influence of money on her own life as well as the broader society. She then provides practices for bringing money out of the shadows, healing its wounds, and creating a new relationship with money based on our true “heart.” Seeing our relationship with money as central to the spiritual path helps create a more balanced, healthy life for ourselves, our families, our communities, and the planet. Maggie will speak briefly about and read from the book around 7:30 pm. Drinks and light snacks will be provided. Copies of the book will be available for purchase with check, credit card, or cash if exact change ($15). More info on the event here. Are You Proactive about Aging?